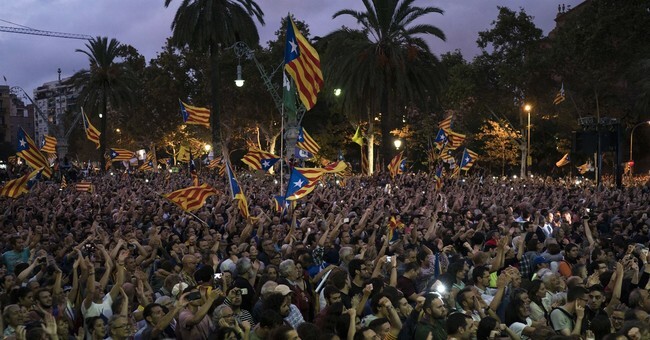 Recently, people in Catalonia voted to break away from Spain -- not to declare war on Spain or refuse to trade with Spain, just to control their own affairs. The Spanish government said they must not even vote. They sent police to shut down polling places and beat protestors into staying off the streets. Governments never want to give up power. The European Union was offended and American politicians shocked when the United Kingdom voted to exit the EU (Brexit). Pundits declared Britain's move a terrible mistake. But local governments can be more responsive to the needs of constituents. No government is perfect. But keeping government close to home, keeping it local, makes it easier to keep an eye on it. The powerful prefer one big central government. Some want the whole world to answer to one government. President Ulysses S. Grant fantasized about countries becoming "one nation, so that armies and navies are no longer necessary." President Harry Truman wanted a World Court. Just as American disputes are settled by our Supreme Court, he said, "There is not a difficulty in the whole world that cannot be settled in exactly the same way in a world court." But central authorities aren't the best way to solve our problems. Competition is. In the U.S., state governments behave not because their politicians are noble, but because people can "vote with their feet" -- move to other states. If taxes get too high in New York, you can move Florida. As California tortures businesses, Californians move to Arizona and Texas. The more governments from which you can choose, the easier it is to benefit from competition between them. All Americans, however, must obey rules set by Washington, D.C. But what if most people in a state reject those rules and demand the right to govern themselves? There have been several secession movements in California -- a plan to break California up into smaller states, a push to make Northern California a breakaway state called Jefferson, and now the "Yes California" movement that wants to make California a separate country. Calexit's proponents say Californians shouldn't have to answer to that evil President Trump. If Calexit ever happened, I suppose conservative parts of the state would vote to separate from the leftists who dominate Sacramento. Maybe we'd end up with three countries where there used to be one. When I look at how badly Washington, D.C., governs, the idea of secession doesn't scare me. After the Cold War, Czechoslovakia split into Slovakia and the Czech Republic. "Tensions between Czechs and Slovaks have disappeared," writes Marian Tupy, a Cato Institute analyst born in Czechoslovakia. "Czechs no longer subsidize their poorer cousins in the east, while Slovaks no longer blame their problems on their 'big brother' in the west. Everyone has won." Secession frightens some Americans because they associate it with slavery. Preserving that despicable practice was one reason southern states wanted to break away. But obviously, one can favor secession without supporting slavery. Even some abolitionists, anti-slavery activists in the 19th century, supported the right to secede. More recently, some black neighborhoods on the outskirts of Boston argued for turning the Greater Roxbury area into a new city called Mandela. They say it would be more responsive to locals' needs. In New York City, Republicans on Staten Island sometimes argue for breaking away from the Democrats who mismanage the rest of New York. During the Obama administration, some Texans wanted a vote on "Texit." None of those things are likely to happen, but I'm wary of any government that hates the idea of people escaping its influence. President Trump weighed in on Catalonian independence. He's against it. "I would like to see Spain continue to be united," said the president. It's easy to love a big central government when you're in charge of one. Also, national governments can inspire proud nationalist sentiments. But Catalans smarting from police batons probably feel differently. I say, let people go their own way.